Fox PVA is the very highest quality and is supplied on a 10m Funnel and Plunger System at a price for which many other tackle companies only offer 7m! It is available on a Wide (35mm), Narrow (25mm) or new Super Narrow (14mm) tube in both fine and heavy mesh to suit varying conditions or bait size and there are a variety of cost effective refi ll options with both 10m and 25m refill spools available for all sizes. To complement the range Heavy and Clear Embossed PVA Tape is also available on 20m spools. PVA - fine or heavy? Fine Mesh dissolves quickly - even in cold water - and allows small feed items such as maggots, micro pellets or groundbaits to be used without risk of them falling out. Heavy Mesh has a slower dissolve time and is perfect for warmer or deeper water and is suitable for larger pellets, particles and boilies. 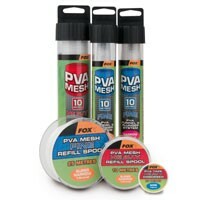 Both Fox PVA meshes have a tough, anti-ladder construction that resists damage and handling.